2017 JUNO nominees and SiriusXM winners Sultans of String create “Energetic and exciting music from a band with talent to burn!” (Maverick Magazine UK). Thrilling audiences with their genre-hopping passport of Celtic reels, flamenco, Gypsy-jazz, Arabic, Cuban, and South Asian rhythms, fiery violin dances with kinetic guitar, while bass and percussion lay down unstoppable grooves. Throughout, acoustic strings meet with electronic wizardry to create layers and depth of sound. With their 5th album, Subcontinental Drift, they serve up a blend of ragas, reels and rumbas with sitar master Anwar Khurshid (featured in the Oscar winning Life of Pi, Kama Sutra, and Love Guru). Fusing the virtuosic talent of Anwar Khurshid adds to their truly global and mesmerizing sound!” With their 6th album, Christmas Caravan, Sultans of String have expanded the traditional notion of Christmas music, injecting it with new-found energy and non-traditional sounds. Recorded and co-produced with JUNO Award winning engineer John ‘Beetle’ Bailey, this isn’t your typical holiday album. You may recognize a few titles, but you’ve never experienced seasonal music quite like this before. “We wanted to make a real contribution to the Christmas repertoire, and hopefully create some new standards” says McKhool. “This is a seasonal album, but approached from the perspective of a world-music band. We explored diverse genres, from Quebecois fiddle tunes to collaborating with a traditional Turkish string ensemble, and jump around from the classic sounds of the Andrews Sisters, to a Himalayan sleigh ride, African roots music, Gypsy-jazz, rumba flamenco, ska, and the grandeur of the symphony.” Christmas Caravan hit #6 on BILLBOARD World Music charts in the first week of it’s release. Since forming 10 years ago, Sultans of String’s CDs have hit #1 across Canada on Top 10 national radio charts, and received multiple awards and accolades, including 3 JUNO (Canada’s Grammy) nominations, 1st place in the ISC (out of 15,000 entries), 3 Canadian Folk Music Awards, plus invitations to perform/record with such luminaries as The Chieftains, Richard Bona, and Ruben Blades. Bandleader Chris McKhool (Jesse Cook, Pavlo), who was awarded a Queen’s Diamond Jubilee Medal, grew up in a Lebanese-Egyptian (Makhoul) house bursting with music and diversity. Growing up, he was fed a steady diet of delicious musicality alongside Middle Eastern cuisine and violin lessons. 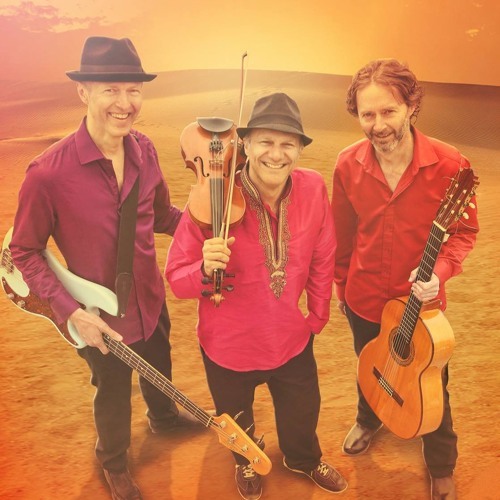 When McKhool first heard founding guitarist Kevin Laliberté’s (Jesse Cook) rumba rhythm, their musical synergy created Sultans of String’s signature sound – the intimate and playful relationship between violin and guitar. From this rich foundation, the dynamic duo grew, featuring such amazing musical friends bass master Drew Birston (Chantal Kreviazuk), jaw-dropping Cuban percussionist Rosendo Chendy Leon (Alex Cuba, Parachute Club), guitarist Eddie Paton (Robert Michaels), as well as special guests such as Dala and Alex Cuba. Sultans of String have been criss-crossing North America for the last several years at many taste-making forums such as JUNOFest, legendary jazz club Birdland in NYC, the renowned Celtic Connections Festival in the UK, US syndicated radio, and their sold-out show at Koerner Hall (Toronto’s Carnegie Hall).